(BEIRUT, LEBANON) — The International Committee of the Red Cross (ICRC), together with the Lebanese Red Cross (LRC), is organizing a special photo exhibition to mark the 40th anniversary of the start of the civil war in Lebanon. The exhibition will feature photographs from the Red Cross archives and from Lebanese photographers, depicting humanitarian work carried out by the ICRC and LRC during the conflict. The civil war in Lebanon, which lasted for 15 years, left thousands of people dead and injured. Organizers say outcomes of the Lebanese Civil War continue to plague the country today. The photographs at the exhibition will illustrate many of the humanitarian issues faced in Lebanon during the past four decades. The exhibition takes place between 17 and 26 April, 2015 at the Villa Paradiso, Gemmayzeh, Beirut. Lebanese moms are unique. On this Mother’s Day, we pay tribute to the gem of the family with 7 universal facts about every Lebanese mom. One of her most important goals in life is to make sure you never starve. Your mom makes enough food for the whole family and more — just in case a few neighbors stop by. No matter what you do in life, in your mom’s eyes, you’re a star. Your mom gets fired up when making a long distance call. She hasn’t realized phone connections have made significant improvements over the past decade. Do not disturb your Lebanese mom when the soap opera begins. Nothing can come between your mom and her coffee. Fady is married, has two kids, and a good-paying job — what are you waiting for? Your mom loves you so much that she’s willing to literally “bury” (to2borni) herself for you. Happy Mother’s Day to our graceful, glamorous and loving Lebanese moms! There aren’t enough adjectives to describe you! (BEIRUT, LEBANON) — Two American tourists explored Lebanon’s capital city on fixed gear bikes recently, navigating through thick Beirut traffic and touring the city’s juxtaposing ancient and modern cultures. Nico Deportago-Cabrera of Chicago and Austin Horse of New York are bike messengers through Red Bull’s urban cycling endorsement program. Bike messengers typically work for courier companies who carry and deliver items by bicycle. They’re often found in busy metropolitan areas, where bicycle travel is less subject to city traffic jams, parking limitations, and fees or fines. Beirut narrow roads and chaotic drivers are often difficult to navigate on bikes. Deportago-Cabrera said he enjoyed the challenge. (BEIRUT, LEBANON) — Carol Malouf has many titles — journalist, political consultant, university lecturer, and media advisor. But in recent years, she’s added social activist to that list after launching a Lebanese NGO to help Syrian refugees. “Lebanese for Refugees” was founded in December 2013 after Malouf was contacted by the municipality of Arsal to document the plight of over 400 Syrian refugee families, according to a report by Global Voices Online. Malouf was inspired to raise money to provide blankets to Syrian refugees in Lebanon during cold winter months. But she realized it wasn’t enough. The project quickly grew into large donation drives of clothes, shoes, toys, blankets, food and money, using more than two dozen trucks to distribute the aid to several refugee camps. The NGO has raised more than $100,000 in just three months from December 2013 to March 2014, and $20,000 in January 2015 alone. The donations come from independent donors and other NGOs and organizations, including the Islamic Relief Committee, the U.S. Embassy in Beirut, the European Union, and Foodblessed. Despite Malouf’s attention to refugees, she hasn’t lost her roots in journalism. She writes regularly for the Daily Telegraph, Al Jazeera English, and Al Joumhouria, among others. She is also a frequent commentator and analyst for ABC News Australia and other Lebanese TV stations. Malouf was also the founding member and Senior Middle East Producer at Al Jazeera English, where she extensively covered regional and international news and political stories. She holds a masters degree in politics from the University of Exeter and a bachelors degree in international relations. She is fluent in Arabic, English and French. If you wish to donate to “Lebanese for Refugees”, visit their Indiegogo campaign at this link. Want to combat corruption in Lebanon? There’s an app for that! (BEIRUT, LEBANON) — It’s no secret that bribery, nepotism, embezzlement, kickbacks, and vote-buying often plague Lebanese institutions and government agencies. In fact, the Global Integrity Index classifies Lebanon as a “very weak country” in terms of integrity. But a Beirut-based NGO is trying to change the culture of corruption by encouraging Lebanese citizens to report an act of corruption when they witness it. The app is called “Sakker El Dekkene”, or “Shut the Store” in English, and it was founded by Lebanese anti-corruption activist Rabih El Chaer. Citizens can anonymously report bribes, kickbacks, and other corruption by simply entering the name of the agency and description. El Chaer says the reports are then published online for other citizens and government agencies to see. He adds that curious lawmakers have already begun watching the app, as over 3,000 Lebanese citizens have begun issuing reports. El Chaer says the app could serve as a solution to introduce reforms that combat corruption. El Chaer is the founder of the Human Rights Center at the University of the Holy Spirit in Lebanon. He was formerly the Managing Director of the Lebanese Transparency Association and a legal advisor to the Minister of Interior and Municipalities. (BEIRUT, LEBANON) — Lebanon’s Telecommunications Minister Boutros Harb recently signed a $6.4 million loan agreement with the World Bank to establish a new NGO that would help Lebanese youth launch tech startups. Karam says the project is part of a mobile internet ecosystem fund, which was launched last year during Open Innovation Week in Beirut. The NGO, which will be called MIHub, or Mobile Internet Hub, will provide a forum for Lebanese youth to increase open innovation and crowd-sourcing in Lebanon. Officials say the program expects to launch over 60 startups and will accept 500 students over the next four years. Projects will include mobile app development, micro-enterprising projects, incubators, and the launching of angel investor groups. Harb says Lebanese youth can help drive Lebanon into a new age of modern consumer technology. Karam agrees, and adds that Lebanese universities in particular, can play a major role in this project. “Through partnerships with Lebanese universities, we will be organizing regular workshops on robotics, mobile apps development, web development, and other core tech industries,” Karam said. (DETROIT, MI) — The Lebanese Collegiate Network will host more than 150 Lebanese students and working professionals during the eighth annual LCN convention at the University of Michigan in Ann Arbor from April 10 to April 12. The convention draws students and professionals from across the country for networking events and professional development workshops, according to the group’s press release. Sadek says the workshops have included business presentations, resume building seminars, and marketing classes, among others. They’ve also had major keynote speakers including Lebanese Ambassador to the U.S. Antoine Chedid. “The convention provides a medium for students to connect and collaborate while having a ton of fun,” he said. Sadek adds that most LCN members are students enrolled in 4-year academic programs. This is the second time LCN hosts their convention in Michigan. The group gathered at Oakland University in Rochester, Mich. in 2011. The cost to attend the two-day convention is $80 for LCN members, and $85 for non-members. For more information, visit mylcn.org. Editor’s Note: Krista Abboud’s piece, ‘Growing up as a Lebanese-American’ appeared on CNN iReport on Feb. 14, 2015. The following post chronicles her upbringing in modern Lebanese-American culture. My name is Krista Abboud, and I’m a 25 year old female Lebanese-American. Both of my parents were born and raised in Lebanon. Taking that a bit further, everyone in my family was also born and raised there. I was the first person born here, making me a first-generation American. It’s definitely a different lifestyle growing up with foreign parents and family, and I wouldn’t have changed that experience for the world. I have always considered it a blessing to be able to know two worlds, speak two languages, and have such a morally strong culture embedded in me. I was born and raised in Pittsburgh, Pennsylvania. Since I was a little girl, my parents would always speak to me in Arabic. They never wanted me to lose the language. They knew once I started school I would be speaking English non-stop, and they wanted me to master the art of both languages. My grandparents on my dads side spoke no English at all, which probed me to always speak Arabic with them. My grandparents on my moms side knew a good amount of English, but also always spoke to me in Arabic for similar reasons. My most fond memories growing up are the times I visited Lebanon with my parents. I remember it being something I always looked forward to. The weather, the food, the beach, the people — all of it felt like home away from home to me. Lebanon is one of the most beautiful places I have ever been to. Lebanese people have such a distinct culture, it was hard at first to mesh with my American friends. I always had a lot of Lebanese friends growing up, because we just understood each other. We were used to the ‘no boys’, ‘no sleeping outside of the house except at grandmother’s house’, ‘no speaking English’ atmosphere. Whereas, with my American friends, this was all a new and strict world for them to see. I remember being envious of girls at a young age in my class that were allowed to have boyfriends and sleepovers. I always assumed they had much more freedom than me to go about things the way that they wanted to. I never understood why my parents were so strict, and why they disabled me from doing anything ‘fun’ at the time. It wasn’t until I grew up a little bit and started to understand the discipline, that I began to admire my parents and my culture in total. My dads story is one I always tell to people, not only because he is extremely close to me, but also because it displays why he is such an amazing father, husband, and person in general. My dad came to America in his late teen years with barely anything in his pocket. He worked at multiple jobs, he put himself through school, got himself an apartment, bought a car, and worked as hard as he could to build a better future. His story is the epitome of the ‘American Dream’ that people speak of. He came here with nothing, grew up with nothing, and somehow hard work allowed him to persevere in so many ways. That is one of the biggest reasons I admire him. He is the most humble person I’ve met. He is selfless and always seeking to do good and to help others. My mom had quite a different story, but I think that is why her and my dad meshed so well. She grew up with a lot of money. Her dad flew her and my uncle here in their teen years and set them up at a nice apartment. She went to college at Duquesne University (where 20 some years later i ended up attending as well) and she met my dad through mutual Lebanese friends. Growing up with money never shaped my moms giving side. She had the money and she liked to spend it on others. My mom always made sure to teach me the do’s and don’ts of being a Lebanese woman. She is also the epitome of what a true Lebanese morally embedded woman is. I am blessed to be like her in a lot of ways. Every summer I was inclined to go to Lebanon for a month or so, attend a Lebanese youth retreat, or to attend the National Apostolate of Maronites Convention (known as NAM). Our people really like to stick together in more ways than one. I started attending youth retreats, which enabled me to meet Lebanese Americans all over America (as we would all meet in a different city every year). This was beyond a cool experience for me. I got to meet people my age who were going through the same things I was, and actually understood me. It wasn’t weird for me to express to fellow first generation Lebanese Americans that I wasn’t allowed to do sleep-overs or have a boyfriend. The response I received was always coming from an understanding similar stance. The stereotypes of growing up in a Lebanese household are usually funny but very true. You were told to be a doctor or a lawyer. (This devastated my parents to know after one year of law school, it wasn’t for me). You were told to only date and marry Lebanese people. (The thought process was because no one else fully gets our culture and why we do the things we do. Also, children growing up and speaking arabic was a key factor in thinking about who to marry.) Hummus, grape leaves, kabobs, rice, and other Mediterranean style food were consistently a part of my weekly menu. Which wasn’t so bad, Lebanese food is amazing and extremely healthy! I would say the peak of understanding everything started when I was about 18 years old. I went back to Lebanon after not going for a few years. This trip was different for me. Maybe it was because I was maturing in a different way, but the stars aligned with certain things and I began to fully understand both worlds. I spent 3 and 1/2 months in Lebanon to test out if I could ever live there full time. The answer is probably not. Spending that much time away showed me how much I appreciate America and where I was born and raised. 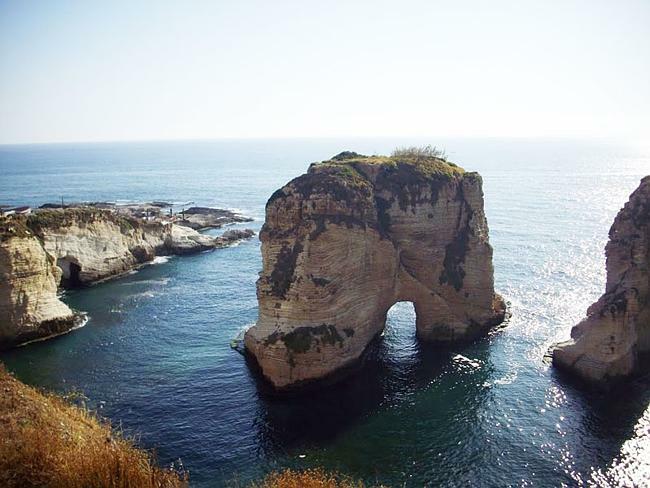 Lebanon is a beautiful place, but there is a reason everyone from my family came to America. This trip showed me different things about my culture and why we are the way we are, why a lot of us think the way we think. Lebanon can be a bubble at times (for people who never got the opportunity to leave) and I consider it a blessing that my family was able to migrate here. Through time, a lot has been revealed through my family Americanizing a lot of their ways. Don’t get me wrong, we still have the important factors of our culture and roots embedded in us — that will never go away. We still speak, read, and write Arabic as much as possible, we listen to the music, and we eat the food. There is just a bigger understanding now (for example for my parents) after living here for over 30 years they understand why things work differently than they do overseas. It is funny to see a lot of modern culture using things I grew up doing and knowing about: I.E. hummus, hookah, belly dancing, etc. I truly hope all Americans realize what they have here. Because, outside of these walls things are extremely different. All in all, as I stated in the beginning of my passage, I would never change the way I grew up or the things I was subjected to for the world. Every aspect was a learning curve and humbled me, and also shaped me to become the person I am today. The program, which is expected to launch this month, will be called “The Sisters” and will follow the lives of Nadine, Alicia, and Farah Abdel Aziz. The Abdel Aziz sisters are passionate Kardashian fans and fashion bloggers for a page called “Styleinbeirut,” which has become one of the most popular fashion pages in Lebanon with more than 100k Instagram followers. “Our aim is to connect fashion around the world and to show the whole world how Lebanese women are smart, stylish and beautiful,” the sisters said in a statement. Just like “Keeping Up with the Kardashians,” television cameras will follow the Abdel Aziz sisters and document their every move for the reality show. The sisters say their show will shed a better light on Lebanon. “We want to show (the world) that Lebanon is not just a country struggling with issues but Beirut is and will always be the Paris of the Middle East,” they added. But some bloggers are wondering how Lebanese culture will respond to a reality-style program. Editor’s Note: Taghred Chandab, author of the travel website MyArabia.me and mother-of-three, published ‘The truth about one of the world’s most dangerous places’ on her blog in early January. The following post chronicles the Australian family’s journey in Lebanon. “Would you like to come with me to Lebanon?” my father would often ask me when I was a teenager, as he planned his annual trip to his home country. “No!” I’d reply arrogantly, shutting down any idea of traveling to that place so far away. I’d heard the stories of girls returning home to be married off to a cousin who was only ever interested in getting an Australian visa — his ticket to freedom. As the years passed, my father stopped asking and I never broached the subject. Shamefully, my youth was spent distancing myself from my Lebanese heritage. Lebanon was a tiny nation far away from Australia, where I was born and raised. It reminded me of my father’s strict Middle Eastern culture, one which shaped my lonely teenage years. Why on Earth would I want to be connected to the country? My father is from a small village in Syr el dannieh, in North Lebanon, 22 kilometers from the country’s second largest city, Tripoli, and several hours from cosmopolitan Beirut. Throughout my childhood I’d heard tales of gunbattles and family feuds — my uncle was once shot in the crossfire between quarreling neighbors. But it turns out the Lebanon I’d imagined was a far cry from the real beauty of this small country, bordered by Syria to the north and Israel to the south, and situated at the crossroads of the Mediterranean Basin and the Arabian hinterland. Its rich history and cultural and religious diversity is a result of all these influences. Like the millions of Lebanese expats scattered around the world, my parents left Lebanon at the beginning of the Lebanese Civil War in 1975. Before that, my mother says, Lebanon was compared with Switzerland, and Beirut was the “Paris of the Middle East”. Like many other Lebanese, they had planned to return, but 40 years on they are still in Sydney. Fifteen years of civil war had created great divisions among religious and political groups that still stand today, making life difficult and even dangerous. As I grew older and became more fascinated with Middle Eastern politics, the need to travel to my parents’ birthplace grew stronger. My first visit in 2011 with my husband and daughters was brief — just four days. I went to Syr, where I met my aunt and cousins for the first time. Although it was difficult to do or see anything with my three small children, we still managed one important trip to my father’s property in the mountains. As the sun set over the snow-covered peaks, I knew I was exactly where I needed to be. In that moment, I promised myself that I would return to explore Lebanon fully. Several months after that first visit back in 2011, the Syrian uprising began, and the hundreds of thousands of refugees spilling into the country had a profound impact on Lebanon. The United Nations estimates that today there are over 1 million Syrian refugees in Lebanon. My mother’s extended family escaped Homs in Syria and now live in Tripoli. Lebanon is deeply divided over the Syrian war, creating further problems. In August 2013, a car bomb ripped through a busy shopping street in Hezbollah’s stronghold in the southern suburbs of Beirut, killing 21 people and injuring hundreds. It was the deadliest attack in the Lebanese capital since the 2005 assassination of the former Prime Minister, Rafic Hariri. And December 27, 2014 marked the first anniversary of the assassination in Beirut of former Lebanese finance minister Mohamed Chatah. With so much unrest in Lebanon, I kept putting off my return. Until the moment when I decided that if the Lebanese people could bravely live through this tumultuous time, there was no reason why I shouldn’t return. Besides, giving in to fear would have meant giving in to the militants and political factions happily spreading hate and tearing a nation apart for personal gain. 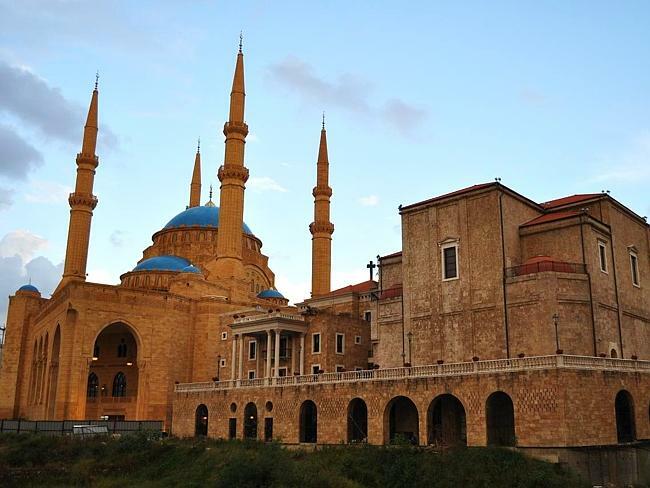 A family wedding in Beirut provided the perfect excuse for a visit Lebanon in December 2014. And living in Dubai in recent years made it easier to travel there (from my previous base of Sydney it would have taken up to 19 hours to get to Lebanon — an effective discouragement). So we went for it, we put our fate in God’s hands and booked five return tickets. As we arrived in the capital of Beirut, I was taken aback by the strong presence of Lebanese soldiers posted on almost every street corner. Amid the Christmas decorations, colourful lights and Coco-Cola-influenced Christmas tree, it wasn’t uncommon to see tanks and armed soldiers posted in densely populated areas such as the Beirut Souks, a major commercial district with over 200 shops. Sadly, the civil war left visible scars on the city’s tattered, bullet-pocked apartment blocks. Narrow streets make it difficult for cars to pass, so locals usually get around on scooters. Bed sheets replace windows in poorer areas where Palestinian and Syrian refugees are housed. Beggars line the streets. Hussein, our tour guide, said Palestinians and Syrians are too proud to beg and the women carrying babies on the streets as a way of seeking sympathy are actually Gypsies who make a living scamming tourists. Anyone who has ever been stuck on the border between Tijuana, Mexico, and the US will understand how it feels to have small children and women approach the car, bang against the window and demand money. I was confronted with this again while driving through the popular streets of Hamra in West Beirut. 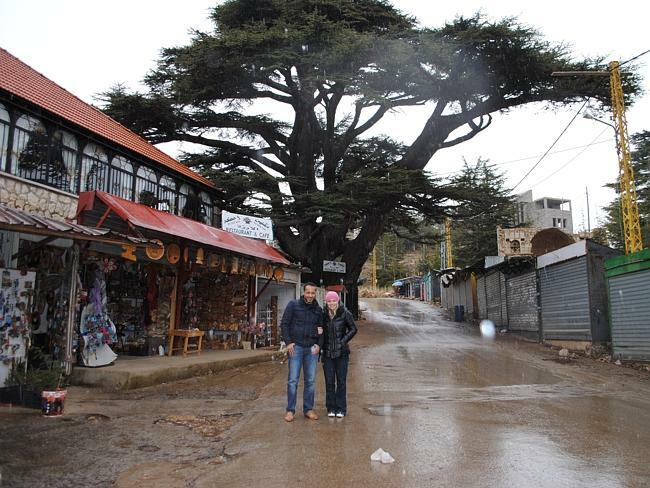 Once we’d left the heart of Beirut, we headed north to The Cedars (Arz Libnan). The scenic drive took us through Becharre — the poet Khalil Gibran’s birthplace — to Qadisha Valley. Located at the foot of Mount al-Makmal in northern Lebanon, the deep gorge is listed as a UNESCO World Heritage Site because some of the earliest Christian monastic settlements were situated here. I couldn’t believe this hidden treasure was in Lebanon, it’s one of the most beautiful spots you’ll ever see. It’s steeped in history: At the entrance to The Grove stands a cedar tree believed to be hundreds of years old. Tourists and locals flock to the area during the heavy snowfall period. I wanted our next stop to be Baalbek, a town in the Beqqa Valley which contains some of the best preserved Roman ruins in Lebanon. But it wasn’t meant to be. Despite my pleas, we were strongly advised by our family in Beirut and in Sydney not to visit another UNESCO Heritage Site. According to our relatives, I was at great risk. Militants have been known to target westerners traveling through the area. “Your wife looks American,” one relative told my husband. “She’s an easy target for kidnappers,” another added. When you travel to a country where there are strong political and religious divisions, your best sources of guidance are locals and tour guides. Instead, the next part of our journey took us to the city of Tripoli, where my mother grew up and where my relatives still live. At nightfall the call to prayer echoed out from Al-Salam Mosque, where just 18 months previously a car laden with 100 kilograms of explosives had exploded, leaving a huge crater and the floors covered with blood. It was the second bomb to explode that afternoon; minutes earlier, the Taqwa mosque had been targeted. Dozens were killed and hundreds more injured. Now, however, the mosque was packed with worshippers. No one takes any chances these days. Armed Lebanese soldiers and tanks heavily guard Tripoli’s streets. Cars left unattended with the engines still running are always a great concern. Unlike Beirut, which has been partially rebuilt since the war to attract tourists, Tripoli is rundown and dirty. Old buildings destroyed during the civil war remain standing, a stark reminder of the city’s harsh history. It was hard not to feel anxious, knowing I was just meters away from where one of the deadliest car bombings had taken place since the war. Even in Beirut’s city streets, you need to be alert. Remember that the country is still stricken with problems, and car bombs can go off unexpectedly at any time. The next day, between family gatherings, we managed to sneak in another impressive tour. On this day our journey began in the valley, Nahr El-Kalb, 18km north of Beirut, and continued to Jeita Grotto, followed by Harissa, a small mountain village 650 metres above sea level, and ancient Byblos. On the way to the grotto, we took a small diversion to a war memorial commemorating the Australian diggers who fought in World War II. I knew little of the involvement of Australians in Lebanon during the war. Australian troops, part of the 7th Division, fought as part of an Allied force in Syria and Lebanon against the Vichy French. 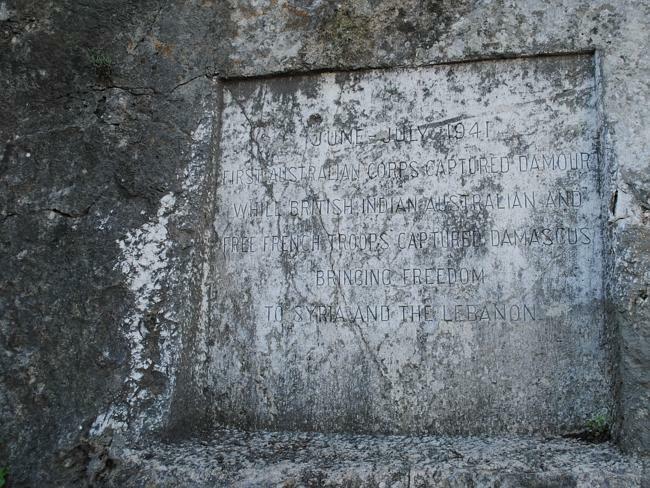 According to the Australian Lebanese Historical Society, the first Australian casualty was Nicolas Koorey, a 26-year-old Australian of Lebanese descent. There were 416 Australian troops killed and more than 1000 wounded in the battle. It’s certainly a history lesson which needs to be more widely taught back home in Australia. As we left the memorial, I felt moved and excited at the same time. Our next stop was Jeita Grotto. Breathtaking. Captivating. Mesmerising. There are not enough adjectives to describe this natural wonder. Millions of years are frozen in drops of water. A very frequent drop-by-drop water flow forms stalactites on the ceilings and stalagmites on the floor of the galleries and halls. 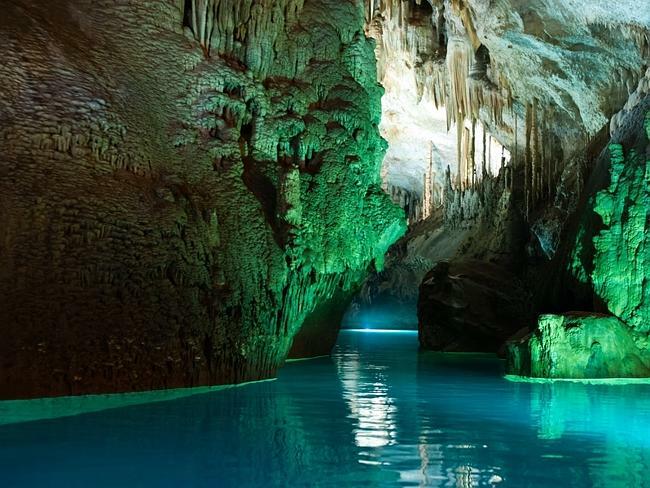 Recipient of the 2013 World Tourism Organisation’s award for best tourist site in the Arab world, the Jieta Grotto houses one of the world’s longest stalactites. It measures 8.2m! This is a must if you’re travelling with children. My daughters wouldn’t stop talking about their “cave” experience, where they took turns to steer a small vessel in the lower grotto. The girls have travelled to many parts of the globe, including France and Italy, but nothing captured their imagination the same way their trip to Lebanon did. We moved on to Harissa, the home of the important pilgramige site, Our Lady of Lebanon. 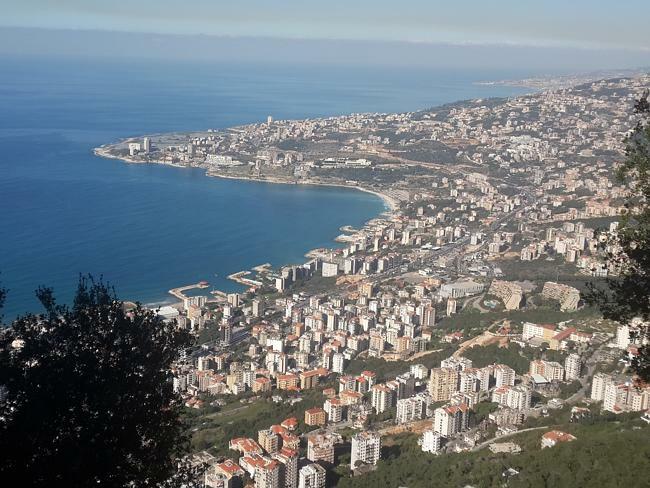 The picturesque village is located 20km north of Beirut, and the best view is from the cable car, from where the city and the Mediterranean Sea look breathtaking. Because of its religious significance, Harissa is often visited by Roman Catholic popes. Then, finally, we visited the 8000-year-old city of Jbeil (Byblos), another 20km away from Harissa. 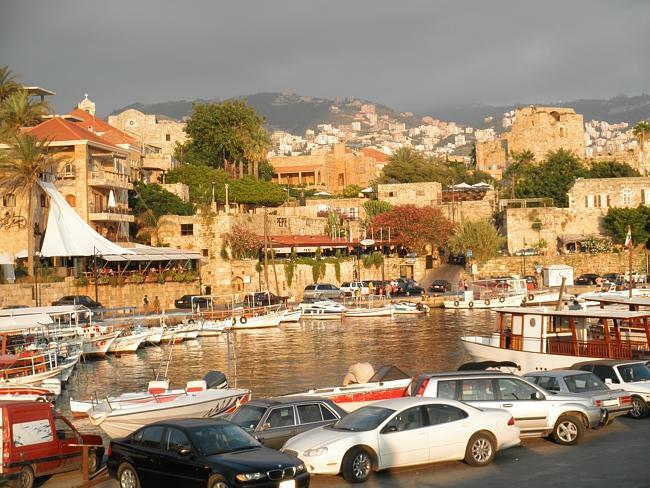 One of the oldest cities in the world to have been inhabited without interruption, Jbeil is now a tourist hub for its ancient port, fish restaurants and shopping at the traditional Lebanese souk. Oh, and the Byblos Castle! There’s no doubt this was one of the most emotional journeys I’ve ever taken. I rediscovered myself and reconnected with my Lebanese heritage. While this tiny nation attracts so many negative mentions in the media, few could believe how deeply enriched it is with history and beauty. Visit Chandab’s Instagram account @arabianmum to see all the images from her trip to Lebanon, or follow her on Twitter: @my_arabia or Facebook accounts.